It’s been eight-plus years since Tom Moore became the Quinnipiac men’s basketball head coach, and he still hasn’t gotten the program to an NCAA Tournament. Yet, those who have observed his operation have faith. Criticism doesn’t bother Tom Moore—but he’d be lying to you if he said he didn’t feel it. Moore, entering his ninth season as Quinnipiac men’s basketball head coach, still hasn’t won a postseason conference tournament. He still hasn’t gotten Quinnipiac to the Big Dance. He’s cognizant of this; he’s aware of all the criticism that comes with leading a Division I program. He saw it first-hand at the University of Connecticut, where he served as an assistant on Jim Calhoun’s staff for 13 years. For Moore, the constant judgment comes with choosing to take such a high-profile job. It’s a part of being a Division I basketball coach. Tom Moore sat down at a podium in the Times Union Center to field questions on March 5, 2015. It was just moments after a 80-74 loss to Marist in the first round of the MAAC Tournament—the end of Quinnipiac’s season. For the eighth-straight season since he took over the program, Quinnipiac’s year ended without NCAA Tournament appearance. Moore was visibly distraught. His eyes were foggy from tears and his voice was raspy at best. Having just shed his dress coat and tie—so that he was only wearing a white dress shirt—he sat down at a makeshift podium in Albany to field questions for the final time in the 2014-15 season. For almost 25 minutes Moore, senior Ousmane Drame and freshman Dmitri Flores answered questions. One came from Jon Alba who was the general manager of Q30 Television—a student media organization at the university. Alba, citing the “outcry on social media” since the game’s end, said that some wondered whether or not Moore was fit to continue as the team’s head coach. Moore hadn’t gotten the Bobcats to the field of 68 yet, and Alba asked “if there was much more” the staff could do with what it had been given. After saying he didn’t understand the question, Moore simply replied that Quinnipiac expected to reach the NCAA Tournament the following season. Later in the press conference Drame—who had just recorded 27 points and 23 rebounds in the loss—interrupted another reporter’s question to go back and address Alba’s. “…For you guys to actually listen to that or have the audacity to ask a question about what [people on social media] are saying, it’s almost kind of disrespectful…” Drame said. Drame went on to explain that Quinnipiac’s transition from the NEC to the Metro Atlantic Athletic Conference had a lot to do with its recent failures, pointing out that the MAAC is a much tougher league to win in. Looking back, Alba agrees with Drame’s sentiments, adding that he would have approached the topic of Moore’s job security differently. “It was a question that needed to be asked, but it was the wrong time and I think I went about it the wrong way,” Alba said. Moore and Alba have spoken since the press conference exchange on March 5, and both said said they remain on good terms. 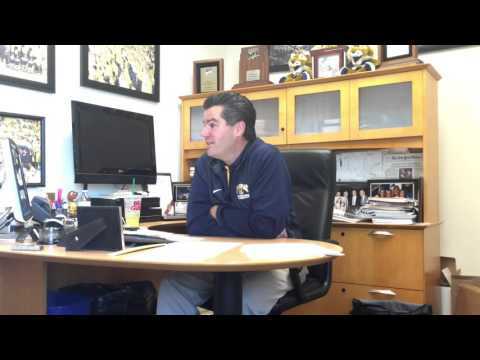 Quinnipiac Director of Athletics and Recreation Greg Amodio spent just over four hours in a meeting with Tom Moore and the men’s basketball staff on Aug. 28. The meeting, designed to “hammer through” every aspect of the way the program runs, was initiated by Amodio. One of the first things he wanted to do upon arriving at Quinnipiac was sit down with each athletic team’s coaching staff to discuss things. Moore himself made $498,885 in 2013, making him the fourth-highest paid employee at the university, the university’s latest 990 form shows. In order to help Quinnipiac move forward, Amodio needed to know the ins and outs of Moore’s operation. He needed to know what they already do well, and how they could improve in the future. Most of all, he wanted to know what he could do to help them reach the next level of success. It’s something that has eluded Moore for a long time. The former Duquesne University athletic director was pleased with the conversation he was able to have with Moore and his staff. By the end of the meeting, he realized one thing. Former Quinnipiac Director of Athletics and Recreation Jack McDonald has made the drive from his home in Boston to Quinnipiac many times in his life. While with the university from 1995-2015, he would often turn his radio dial to the University of Connecticut’s basketball broadcast after he crossed the Connecticut River. He liked to keep up with how UConn and longtime friend Jim Calhoun were doing. One night, McDonald heard Tom Moore speak during the radio’s post-game show after a UConn victory. He was immediately impressed with Moore’s knowledge for the game, and the “classy and sophisticated” way in which he presented his point of view. McDonald always kept three important documents in his office: Drawings for the next athletic buildings, information on the next conference Quinnipiac wanted to join and a list of coaching candidates in every sport — just in case he needed to make a change. Driving back to Hamden that night, he reminded himself to add Tom Moore to his list for men’s basketball. “I can remember thinking to myself, ‘if we ever get an opening, this is our guy,’” McDonald recalled. And sure enough, Quinnipiac got an opening in 2007, when 11-year head coach Joe DeSantis was fired. Moore, backed by his experience from UConn, saw an opportunity. In 2005, Moore had a few offers to become a head coach, but none he was ready to leave UConn for. He was a bit more open to leaving in 2006, but none of the interviews he went on felt quite right. By 2007, he was ready. He interviewed at Quinnipiac and an Atlantic 10 school, though the Atlantic 10 school was “a lower level program,” Moore said. Coaching at the TD Bank Sports Center (which had just opened in 2007), the program’s budget, his salary, the academics at the school, the administrational commitment and the location were all reasons why he was attracted to Quinnipiac. Now, he would be tasked with trying to guide the program to new heights at a Division I level. The Bobcats had gone 62-80 in their previous five seasons. Moore was brought in to win, but also to increase Quinnipiac’s external image, according to McDonald. “Him coming in, it provided instant credibility for Quinnipiac men’s basketball,” McDonald said. In 2009-10, Moore’s third season in Hamden, Quinnipiac posted a 23-10 overall record and went to the NEC Championship, where it fell 52-50 vs. Robert Morris. In the following season, the Bobcats posted a 22-10 record and lost again to Robert Morris, this time in the NEC Semifinals. In just four years under Moore, the program had gone from one that traditionally finished in the lower half of the conference to a perennial contender. He had added an emphasis on rebounding, as Quinnipiac was beginning a stretch of three-straight seasons finishing No. 1 overall in Division I basketball in team rebounding. “You make one more play, one more shot, one more box-out, one more rebound and you’re looking at an NCAA Tournament bid in either year,” Moore said. The Bobcats had two mediocre seasons after that, going 18-14 and 15-16, respectively. That set up Quinnipiac’s entrance into the Metro Atlantic Athletic Conference, where it went 20-12 (2012-13). But at the end of the year, the Bobcats lost senior point guard Dave Johnson with an ACL injury. If it were in McDonald’s hands, he would stick with Moore to run his men’s basketball program forever. Before its first season in the MAAC in 2013-14, Moore had built a program full of talented veterans primed for a big season. Quinnipiac had forward Ike Azotam returning for his senior year. By the end of his four years at Quinnipiac, the First-Team All-MAAC selection had set the program record for career rebounds (1,043) and finished No. 3 overall in points (1,603). Drame, who would eventually break Azotam’s career rebound mark, was coming back for his junior year to play alongside Azotam down low. Junior small forward Zaid Hearst, who would eventually become the only team captain ever elected under Moore, was in the mix — as was fifth-year point guard Umar Shannon, who was ready to come in and run the Bobcats’ offense. “What we can say pretty definitively is that they would have been the NEC’s favorite that year, and I don’t think any coach in the NEC would even deny that,” said Adam Finkelstein, a scout/analyst for ESPN’s Recruiting Nation who has followed Quinnipiac’s program under Moore. Finkelstein added that, when talking to other coaches in the NEC, some thought they wouldn’t have a chance to compete given how good Quinnipiac would be. Then the university announced its move to the MAAC. And though the program moved to a more difficult conference, Quinnipiac still won 20 games in 2013-14. But Shannon went down with an ACL injury in the final week of the regular season, keeping him out of the postseason tournament. The graduate transfer from Saint Francis had put up 14.3 points and 2.3 assists for game before going down. The No. 3 seeded Bobcats lost to Manhattan in the semifinals. In 2014-15, junior college transfer Giovanni McLean was set to come in and take over for Shannon and run Quinnipiac’s offense. Hearst and Drame were returning, and the senior-laden squad was yet again expected to make noise in the MAAC. Then, stemming from an investigation involving transcript fraud, McLean was unexpectedly ruled ineligible for the season, hurting the Bobcats’ backcourt once again. In just the past three seasons, conference realignment, injuries and now an academically ineligibility case had plagued the program. In the interview just a month before stepping down from his day-to-day tasks at the helm of Quinnipiac’s athletic department, McDonald said that Moore had been an “athletic director’s dream.” He added that he wanted Moore to stay with the university for his entire coaching career. According to Finkelstein, if the conference realignment hadn’t happened, Quinnipiac could have been to two NCAA Tournaments—which could have made McDonald’s wishes much more difficult. “Then we’d be talking about what Quinnipiac has to do to hang on to Tom Moore for as long as possible,” Finkelstein said. Before each game, Tom Moore paces. Head down, staring at the ground as if it were offering him some sort of advice, Moore walks up and down the sideline while the Quinnipiac starting lineup is being announced. This practice started when he was at UConn. An assistant at one of the fastest-growing programs of its time, Moore would pace up and down the sidelines as the Huskies lineup was introduced. He did it because he was nervous, but also because he knew he needed to stay out of Jim Calhoun’s way—who was equally as nervous. Moore took that same practice to Quinnipiac. Sometimes, his message is successful. Other times things don’t work the way he planned. After the losses, Moore and the entire men’s basketball coaching staff usually stay in his office for two or three hours. They bounce ideas off one another, trying to process what happened and make sense of it all. They don’t pull all nighters, though, because that would cut into the following day’s production. It’s a process that the staff has followed faithfully throughout Moore’s nine years at Quinnipiac. He sticks to his routine. He’ll switch some things Quinnipiac does on the court from year-to-year, he says, but most of the operation behind the scenes remains the same. With patience he’ll have another chance to get Quinnipiac to the NCAA Tournament. He’s confident in that. And when he wins—when he finally gets Quinnipiac to the NCAA Tournament—the critics “won’t have a voice,” according to McDonald. Moore says he’ll think of his past players when it happens, and all of the people at the school who have supported him. He’ll think of Justin Rutty, James Feldeine, Ike Azotam, Zaid Hearst, Ousmane Drame and everyone who was with him throughout the years. Until then, he’ll keep dealing with the criticism and the losses the same way he’s done for nine years. He’ll block it out.